One of the Most Challenging Parts ACE Makes. Complex Forms, Difficult Assembly. Precision Built – Another Success for ACE. 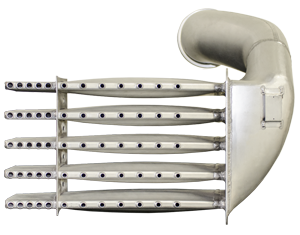 This highly complex air distribution duct is a great demonstration of the capabilities at ACE. It required many technical innovations in order to be manufactured. The base metal of these units is aluminum. That requires a highly skilled TIG welder who joins the pieces with the corrected amount of filler metal. Dozens of complex custom welds require craftsmanship and broad experience working with the metal. 18 separate pieces make up each unit. They start in our drop hammer facility. Then, each individual part is trimmed on our 5-axis laser or our large-bed water jets and sent to welding/assembly for construction. 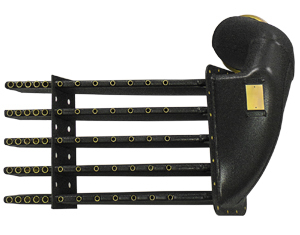 Each “finger” has a flared base that pairs it with another, and a small “cap” piece for a stubbed end. 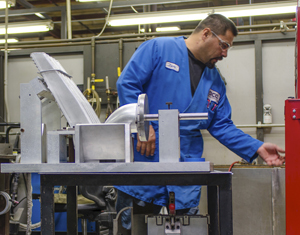 Once the assembly is complete, a precision-machined base from our machine shop is applied. Each hole on the fingers is precisely placed to match the ducts to which it connects on the Boeing KC-135 refueling air tanker. It utilizes exhaust-warmed air to be recycled to other areas of the aircraft to prevent freezing in certain compartments. Because of the attachments it must make to other components, measures must have no more than 1/1000 of an inch variance. Once complete, these units are sent to an outside source for powder-coating, thoroughly inspected and shipped with all documentation to our customer. Precision placement of the holes is paramount for correct installations. A very complex tool was created to align all the pieces. Once completed, the ducts get a powdercoat finish, leaving polished edges for the connection holes.